I feel like coconut is one of those things that people either love - or they totally hate. I used to be on the hating side, but for the last 6 or so years I've been head over heels in love.... because now I know how to use it! Jesse is a fence sitter when it comes to coconut. If the coconut is clearly visible, he'll probably stay away - but when he can't see it so much, he changes his mind. This cake was one that Jesse loved - even though it had coconut in it! 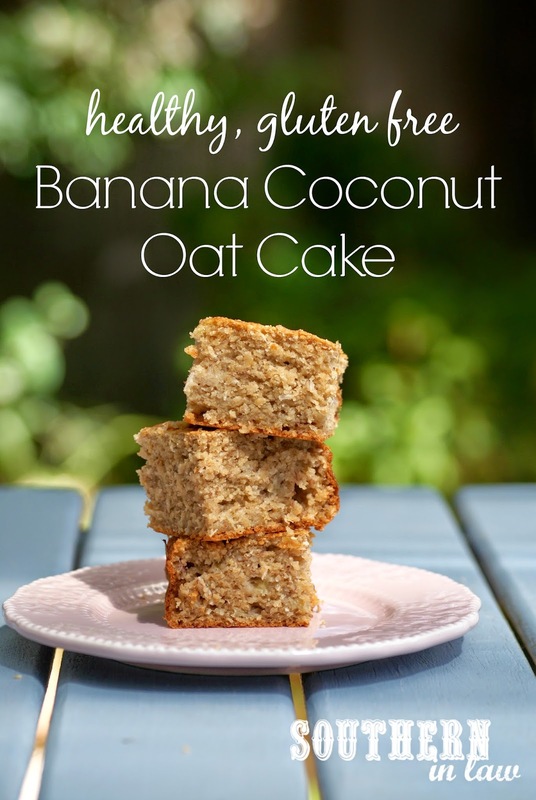 You see, we're always baking banana cakes and banana bread - but I get really really bored with making the same thing over and over, so I like to switch things up! This cake is a little bit more decadent than others - but it's still much much lower in fat and sugar - and it's also gluten free. 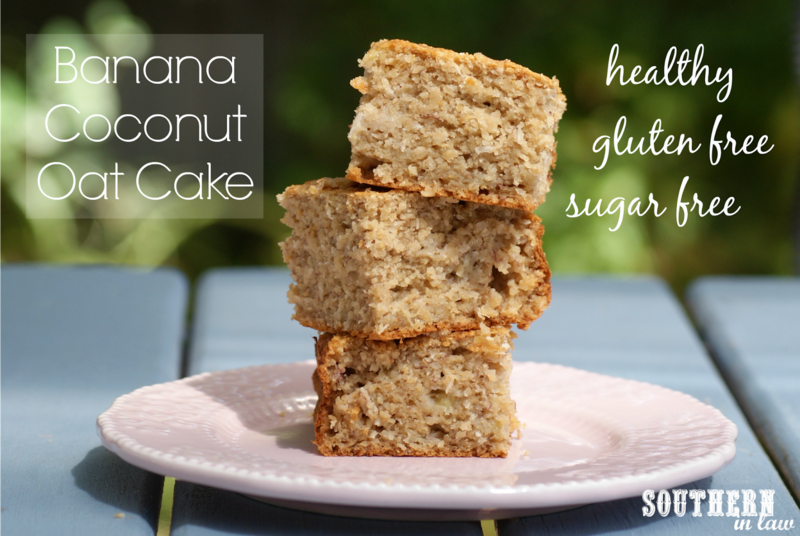 The coconut gives this cake so much flavour that you don't even need to frost it - just enjoy it as is! Well unless you're a frosting fan, then you can frost away! We think this cake would be perfect with chocolate frosting or cream cheese frosting - but you can top it with whatever you fancy! 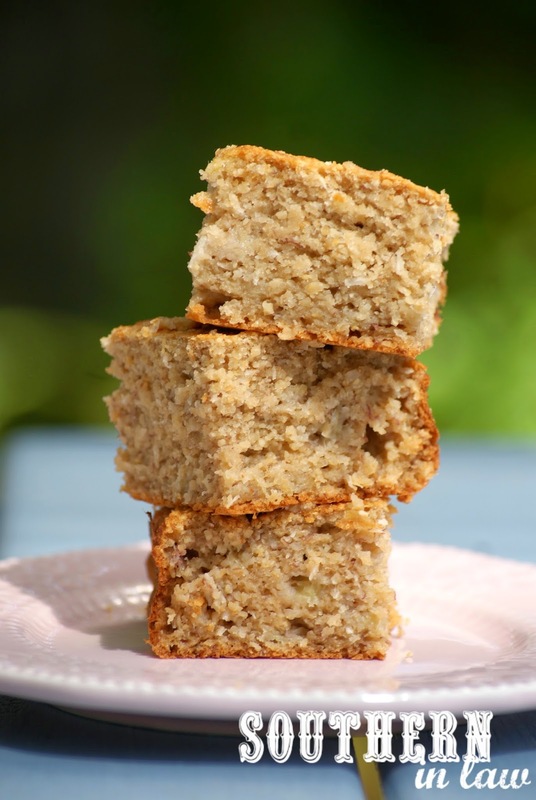 It's one of those cakes that you'll make over and over because you know it's good - and it freezes well too so it's perfect for making in big batches and keeping around for a quick dessert or lunchbox snack. In a medium mixing bowl, mash your bananas with your applesauce until quite smooth. Add in your honey, melted butter, vanilla and eggs and mix to combine. Add your ground oats, coconut, baking powder and baking soda to your wet mixture and mix until just combined. Pour your cake mixture into your prepared tin and bake for 25-35 minutes or until a toothpick or skewer inserted into the cake removes clean and it is golden on top. *Use more/less depending on how sweet you like your baked goods and how ripe your bananas are (riper bananas are generally sweeter). Feel free to use up to 1/4 cup of honey if you really like things sweet. But tell me, coconut - yay or nay? What's one food that everyone seems to love that you despise? Or the opposite, what's the one food most people hate that you love? a big fat yes on coconut! I love it!! just not the nectar, cant stand it! We love oats! Actually just ordered 5kg of wholegrain oats together with barley. These gf bars look so delicious and definitely a must-bake! Miguel is also on the fence with coconut but I love love love LOVE it! Forever and always haha this cake looks awesome. Oh yum! Before I found out I was a coeliac, barley was one of my favourite grains! An oat and barley mix would be delicious! I'm in love with coconut, and my obsession with bananas is no secrets, so needless to say, this looks amazing to me! I made this today, and it turned out perfectly - lovely texture and so delicious, can't believe it's healthy! Went down really well with friends and family. Thanks so much for the recipe, plan to try a few of your other ones too!